Hello and Happy Tuesday! 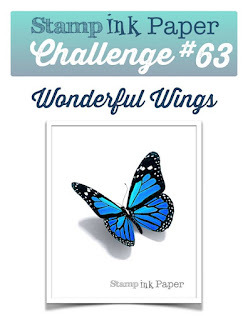 What a wonderful challenge we have over at Stamp, Ink, Paper this week! It's all about Wonderful Wings! I hope you head over and check out all of the awesome inspiration by the Design Team for this one! I decided to use a retired Stampin' Up! Stamp set called Serene Silhouettes! I love every image in this set but I especially LOVE the silhouette of the birds! I used a super fun technique that I call Masked Sponged Background on this card. I learned this from watching a video by Gina K on Stamp TV. In case you've not done this super easy and beautiful technique click here to watch! I have Gina K saved as a favorite on Youtube as well as a few other awesome card makers. If you're not a follower of Stamp TV, you're missing some awesome stuff! I started with an 5 1/2 x 8 1/2" piece of Wisteria Wonder Cardstock, scored at 4 1/4". My next layer was Basic Black that measured 5 x 3 3/4". My top layer was Whisper White that measured 4 3/4" x 3 1/2". I used Wisteria Wonder, Soft Sky and Wild Wasabi ink to sponge my background. After tearing some scrap notebook paper and masking the top and bottom, I sponged the Wisteria Wonder on the top portion, next Soft Sky blending into the Wisteria Wonder and last Wild Wasabi at the bottom and blending up into the Soft Sky Ink. I kept the masks in place to stamp the Bird Silhouette in Basic Black Archival Ink. The sentiment is from an awesome Verve Stamp Set called "Words of Wisdom". I love sentiments that inspire and this set has a lot of awesome sentiments that do just that! As always, thanks so much for stopping by! 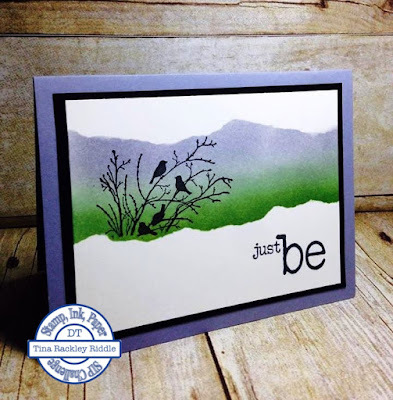 Below is a listing of the Stampin' Up! Products used.